Limitation Periods: How Long Do I Have to Begin a Lawsuit? Home / Blog / Limitation Periods: How Long Do I Have to Begin a Lawsuit? So you think you have a claim against another person or business for harm caused by their wrongdoing. What you may not know is that you have a limited amount of time in which to commence your claim. If you fail to commence your claim within this limited time, you could permanently lose your right to be compensated by the wrongdoer. The amount of time you have in which to commence your claim is called the “limitation period”. Limitation periods are designed to encourage claimants to litigate their disputes in a timely manner. In Ontario, the Limitations Act, 2002 sets out a general limitation period of two years from the date the claim is discovered. So, for example, if you realized on July 19, 2017 that a party you had done business with had breached its contract with you, you would want to bring your claim before July 19, 2019. After July 19, 2019, you would be prevented from bringing the claim due to the general two year limitation period (in other words, your claim would be “statute-barred”). The Exception for Attempted Resolution – This exception allows parties to pause the limitation period while they attempt to resolve their dispute through the use of an independent third party (e.g. mediation or arbitration). Once the attempted resolution process is completed (either successfully or unsuccessfully) the limitation period resumes running. Acknowledgement Exception – If a party acknowledges liability in respect of a claim, the limitation period runs from the date of the acknowledgment rather than the date of discovery of the claim. Therefore, acknowledgment of liability for wrongdoing can effectively restart the limitation period (subject to some qualifications which are beyond the scope of this blog post). Claims Relating to Real Property – Some claims relating to land are subject to the ten year limitation period set out in the Real Property Limitations Act rather than general two-year limitation period. The Ultimate Limitation Period– Generally claims cannot be brought more than fifteen years after the act or omission on which the claim is based took place, regardless of when the claim was actually discovered. However, the ultimate limitation period does not run if the person against whom the claim is made deliberately misleads the claimant or conceals the claim. If you think you have a claim, best practice would be to seek legal advice sooner rather than later. If the claim is not commenced within the limitation period, you could lose your right to recover any damages from the wrongdoer. 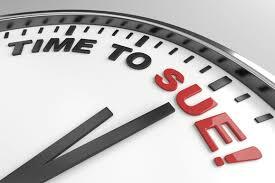 Additionally, it is important that you contact your lawyer well before the limitation period expires as your lawyer will need plenty of time to meet with you, collect any necessary documentation, and prepare the Statement of Claim (the document which commences the claim).